Small cafe in Marathon. I’d been invited to pop some comments in a spiral bound visitors book. I’d obliged. But first intrigued as to who else had come this way. Plenty of Germans. Quite a few Finns. And a smattering of cyclists. Relatively straightforward to spot. It’s the invariably enthusiastic references to food. "Amazing Breakfast!". "Lovely breakfast – good coffee". The latter had "Grilled cheese" scribbled over the top. Of course, I might be wrong. But I doubt it. That’s the joy of the Internet Age. Quick spot of Googling. Reckon one of the British riders works for UK cycling charity Sustrans. Another a "part-time baker" in Weston-super-Mare. Most long-haul cyclists usually stop to chat. But not all…. Ken bumps into a couple of fellow long-haul cyclists.. on a mission… You can find them at www.giveabike.com. Amongst giants from Ken Roberts on Vimeo. First, Keith and Michaela. Their final day on the road crossing North America. First long-haul riders I’d seen riding a tandem. Explained I’d tried one once. Fine on the front, hated it on the back. Unashamedly a control thing I added. Click here to visit their blog. Then Nicholas. Swiss rider, exploring Canada and Alaska. German efficiency with a very American love of weapons. Fallout bunkers in their homes. Why nobody ever invades. A little later, Kierstyn and Peter. Heading for Prince Rupert and a ferry to Seattle. Moving home. Not quite all their belongings in their small trailer, but, I thought, bit of panache and style nevertheless. Beats U-Haul. Dentist chair a fine place for reflection. There was a television screen on the ceiling but my eyes were tightly closed. Can’t abide the sight of metal implements being wielded, even less needles. Besides, daytime television seemed as terrible as at home. I’d enjoyed riding with Mike through Alaska and the Yukon. Shared experiences. Enriched by companionship. And hopefully there’d be chance to pair up with a couple of other cyclists further south around Seattle. Giles, an old school friend, and Amelia, whom I’d met back in Anchorage. I was really looking forward to it. 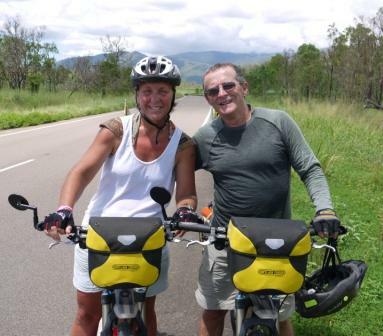 Caroline and Eric were Dutch long-haul cyclists. A chance encounter on the Tok Cut-off, the road less travelled that runs east from the Glenn Highway to the small town of Tok and onwards to the Canadian border. They were two and I was one, so I’d pulled over to their side of the road. But a couple, or father and daughter, I wasn’t sure. They would soon be heading north to Sourdough to camp that night. I explained I’d come from the south, so had little to offer about the road ahead. Other than there was a couple of dusty, coarse gravel sections ahead. And a small shop where the Cut-off met the highway. They said I’d have to take a ride in a pilot car in a short while, not permitted to pedal through road works. I grimaced. Explaining that any break from the saddle was usually more than offset by the plain hassle of taking everything off the bike, only to refit it all a little while later. 1 September 2011. Setting off around the world. From the UK. But not me. I left 2 September 2009. Rather, Emily Chappell. Truth is, I’ve never actually met her. And probably won’t for quite a while. Instead, obliged to follow her progress through her blog thatemilychappell.com. A good read. But what’s really got me intrigued is, well, degrees of separation. For I learnt of Emily through a close friend in Wales who works with her father. And then there’s the other long-haul riders she’s met or been in contact with. The likes of Alistair Humphreys. Shared associations. And Caroline Gilbert. Chance encounter with her in New Zealand just a few months ago. Someone who gets other people killed. Indulging in romantic notions, carefree dalliances at the expense of others. Those innocently duped into rescuing them when the situation gets sticky, plans go awry. I stared at my coffee, willing it to cool so I might finish it and leave. I’d met with a prospective cycling companion in downtown Anchorage. Committed to no more than a coffee. That much I’d been especially clear about, although I’d soon begun to doubt if the other party had quite grasped this. Flighty I thought. Travelling to Alaska on what appeared to be a whim. More klaxon than alarm bells. I couldn’t quite bring myself to walk away immediately. For one thing, that’d be very rude. And I was unsure how the person might react. Badly. Very badly was a real possibility. For, intrigued as I might be as to her past, I deliberately avoided the subject. Sensing demons. No desire to inadvertently open Pandora’s Box. I suggested she might be better taking a ferry from Alaska, a more sensible option given her lack of experience of the sort out conditions we’d likely encounter. Her quick rebuff, that it was pretty much pavement all the way to Seattle, only made me all the more nervous. Somewhat reluctantly, I chose a more direct approach to attempt to dissuade her from doing anything foolish. Bit blunt, but doubtful all the same if anything I said would really register. Explaining I would be leaving in a few days, and could not afford to delay in the slightest. I was ready and she was not. No bicycle. No kit. Things, I added, I’d spent weeks, if not months, putting together. And Alaska was not the place to cut one’s teeth. Exasperated, I’d eventually managed to draw the conversation to a satisfactory conclusion. An amicable parting. Wished her luck and prayed she’d see sense. Secretly hoping she’d not find someone else who might more easily pander to her whims. And end up far worse for his or her troubles. It wasn’t her lack of experience that had troubled me. For I’d met a couple of relatively novice long-haul cyclists in the last few months, either of whom it’d be a pleasure to travel with. After all, I’d been one myself not so long ago. What’d impressed me about them both was their preparedness, the research they’d done and training they’d undertaken. Mentally prepared, committed, you knew straight away they would succeed. That’d be fellow cyclists Chris and Roland I said. Explained I’d met them up in Cairns. While back now. Adding Chris had, I thought, been a British diplomat, Roland, an Aussie landscape garden designer. Very much into environmental and indigenous issues. I’d found a small coffee shop in Maryborough. Chatting to Jason, its young owner. Offering an irresistible deal for coffee and toast. He’d invited Queensland’s Premier Anna Bligh to the opening but she’d politely declined. Other engagements her letter said. On the cafe’s noticeboard. Wished him the best of luck nevertheless. Actually, I’d discovered she only drank tea. Of this I was quite sure. Met her doing a talk radio piece. Jason had seen a few long-haul cyclists pass through the town. Chris and Roland included. He thought they were heading for Rio de Janeiro. Some sort of environmental event. I agreed. As for the others, quite a few, he thought, riding around the whole of Australia. Mostly anti-clockwise. Prevailing winds on their backs. Claire was very clear on this point. They weren’t backpackers. Found myself in whole-hearted agreement. Proper long-haul cyclists. Circumnavigating Australia. The first serious riders I’d encountered. Well equipped, pulling their kit in trailers, they’d started from Sydney. Riding anti-clockwise. Chance encounter on the road. Chatting for twenty minutes or so before the oppressive heat forced us to part company. In search of even the lightest of airs.